I am writing this post while flying to Oaxaca via Mexico City. After leaving the pacific coast we are now heading onwards into the mountains. Here we will see some, I guess, great colonial towns and impressive landscapes. All that’s great but I honestly miss Puerto Escondido already. The article surfing in Puerto Escondido will give you some tips in order to make the best of your trip. The city of Puerto Escondido is located on a hill. Coming down, you can see the long coast of Puerto Escondido. This beach has some different surf spots adequate for very different skill levels. Everybody who follows surfing knows the Mexican Pipeline. This spot produces one of the biggest and fastest wave in the world. The beach has the same name as the surf spot, Zicatela. This surf spot is just for experienced surfers and partially they even struggle with it. Broken boards and even bones are pretty normal at this beast of a wave. So, if there are waves at Zicatela, just go out when you are really confident. I personally surfed a couple of times already but would consider myself far from being ready to surf a spot like Zicatela. Note: You also need to be a bit suicidal when you go swimming at Zicatela. Don’t underestimate the spot, where the Pacific hits the coast with all its power. While surfing in Puerto Escondido you have more than one option. “La Punta” is one of them. The point break “La Punta” refers to the southernmost section of Playa Zicatela. We have been in Puerto Escondido in beginning of February, which is not the time for big waves. Prior our trip I struggled to find information about the conditions in Puerto Escondido and for whom exactly the spots are suitable. Is it worth going to Puerto Escondido even though I don’t want to surf Zicatela? Yes, perfectly fine! At the surf spot “La Punta”, which is located directly beside Zicatela is a significantly softer point break and was great fun to surf. The swell wasn’t too big but it was great to get back into it again in preparations for surfing in Nicaragua. More? At “La Punta” I saw many surf schools, even though I would say it’s not the classical beginners spot with a wide sandy beach, such as Weligama in Sri Lanka, for example. To surf “La Punta” you need to be located close to the rocks as the waves break there. After you paddled the wave you take off to the left and you will leave the section with the big rocks. When you finished riding the wave, remember there are still some rocks, so do not nose-dive into the ocean. La Punta it’s a great spot for advanced surfers who made their first experience already. Even though the swell didn’t come in our week in Puerto Escondido I couldn’t get enough of the spot. You will find yourself sitting behind the lineup in between of pelicans nose-diving for fishes. Just beside you, especially in the late afternoon you will find fishermen with boats and also fishing with nets. Shameless plug: Are you planning a surf trip at the moment? Then our brand new surf preparation workout might be helpful! No more rusty shoulders! Stay longer in the water! Note: Get up early and try to be in the water at 7am. It will be less crowded, less surf instructors pushing their pupils into waves you were waiting for! 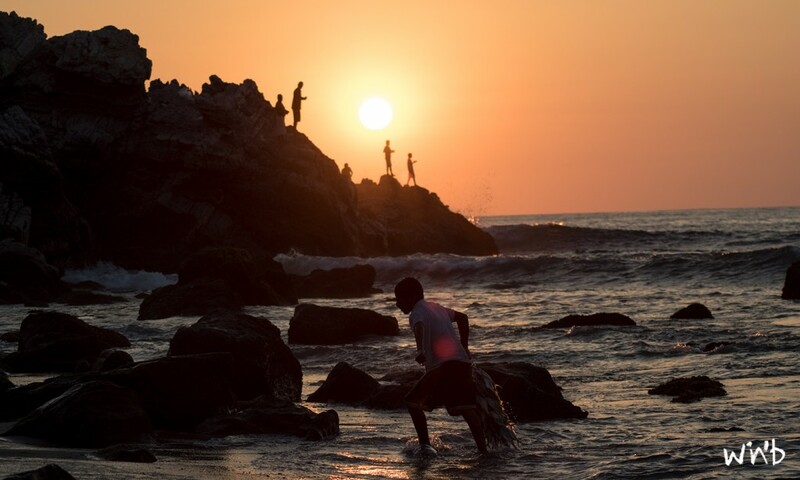 Fancy a second surf in Puerto Escondido? Then after 5pm! Beautiful scenery while the sun sets above the Pacific Ocean. Tip: Mostly the water is nice and warm. Depending in the currents beneath the surface the temperature can be more chilly at some days. That’s why a surf rash like this is* highly recommended. 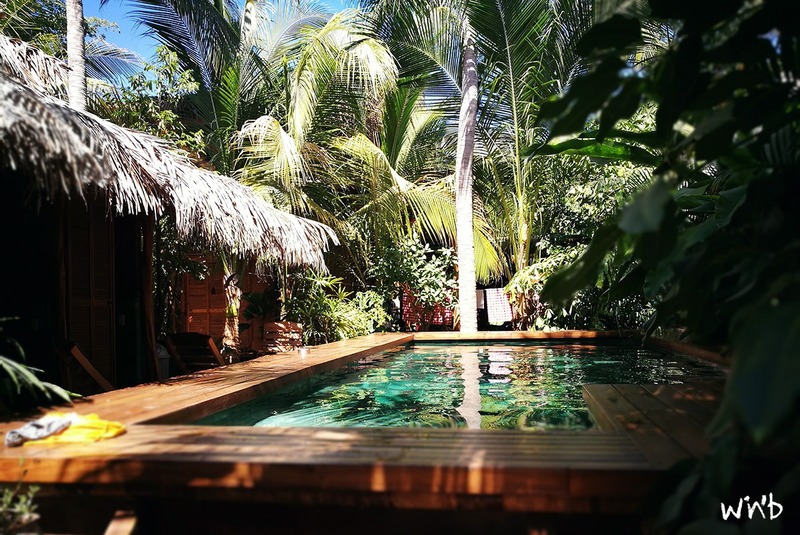 Where to stay while surfing in Puerto Escondido? The town of Puerto Escondido is busy and not that nice as we have expected. That’s why you should not spend your time there, if you ask me. Rather stay in the end of of the beach, with the surf spot “La Punta” just at your doorstep. If you wish to stay closer to the surf spot Zicatela while traveling through México, you will also find a little town with a lot of hostels as well. By the way: Here you can find also some ATMs. We just loved it here. Like a little village “La Punta” has everything you need. Two supermarkets, many restaurants, surf shops, surf board rentals and great bars to zip some Mezcal, Corona or Victoria. All this is located on a small sandy road, which gives the whole village a unique vibe I have never seen in my life before. Even people who are not surfing can relax here with freshly made smoothies, organic food and a vibe you will miss from the moment you sit in the bus or plane for your onwards journey. But for great surfing in Puerto Escondido you need a place to stay where you feel comfortable. We stayed seven nights in Frutas y Verduras* while Surfing in Puerto Escondido and loved it. Our room was painted with surf pictures and had a comfortable bed and a fan. Good vibes during the night as well as during the day! Normally we prefer to go swimming in the ocean and would always prefer that over a pool. As swimming in Puerto Escondido is really dangerous and not really relaxing due to partially strong currents and powerful waves a pool is great to have. Nobody I talked to, who did not stay in Frutas y Verduras had a pool and have been kind of jealous. They just got a beer with us and chilled with us at the pool after catching some waves. Very important to feel home is how clean a place is. Punta Paradiso, which we stayed two nights before was not clean and our first nights haven’t been too enjoyable. Frutas y Verduras is really clean and you feel that this is of great importance for the owners. Café Ole, which belongs to Frutas y Verduras had, for us, the best breakfast in town. As well as that everything you order is delicious. My favorite: Fresh bread with peanut butter and banana. Ani’s favorite: Sweet and savory Crêpes. Price: The prices vary between rooms, we paid for a double room MX$600 per night, which is roughly $30. If you come with a bigger group, you can also rent the pretty badass Pool-apartment. If you stay seven nights, one’s for free! In Spanish you can say “Buena Onda” for “Good Vibes”. This is what you will encounter in the hostel at “La Punta”, too. We have heard just positive things about this hostel. Great thing here: The Cabañas where you stay in are located at the beach and you can hang out in hammocks with sand beneath your feet. We’ve met several people who stay in Buena Onda over and over again. This speaks for itself. Downside: It does not have a pool. Price: Buena Onda is cheaper than Frutas y Verduras with roughly MX$300. As Frutas y Verduras was occupied in the first two nights we were asked to stay at the neighbors, “Punta Paradiso”*. The room was pretty much fine but just a wooden hut without a window. The fan and people here were pretty loud during the night and the facilities were quite dirty. We did not feel very comfortable here and started enjoying Puerto Escondido as soon as we moved over to Frutas y Verduras. Other people we met and hang out with loved the “hippie” vibe there, so it always depends what you want. Note: If you are on a tough budget you can also get a tent for a couple of Dollars per night. When we look back to La Punta we see a beautiful sunset and a Corona in our hand, a surfboard and great food. To find the right places, we will share some the best we have been in. Café Ole belongs to the hostel Frutas y Verduras and will be found almost at the end of the street in La Punta on the left. Everything on the menu is delicious. 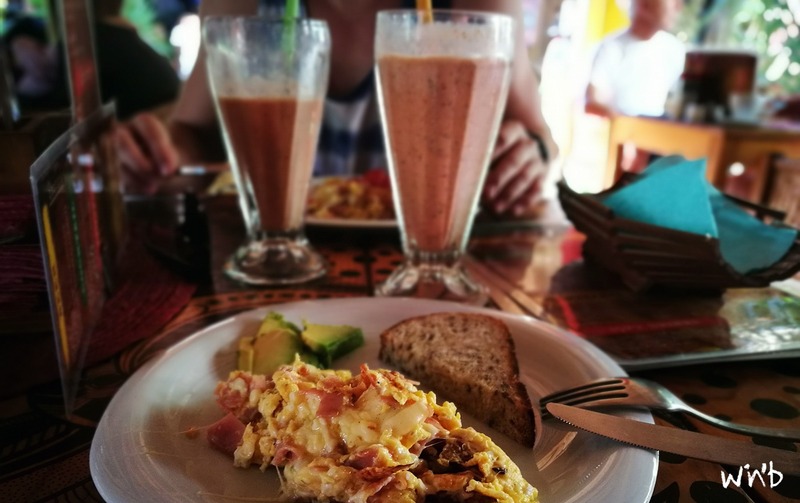 Especially their egg variations and smoothies are a great snack after surfing or the perfect desayuno (breakfast). You will find the tiny restaurant just beside La Punta’s small police station. Amoki offers Hamburgers, Tacos, Pizzas and Burrito for a good price. Especially the burrito is incredible! We have been here several times and always had a nice time. The owners are really nice, too, where you are happy to give some Pesos as a tip afterwards. The only Thai restaurant in La Punta! The location is awesome and the food good. It doesn’t taste very Thai to be honest (at least in our case) but it was really good, even though a bit more expensive than Amoki por ejemplo. Pepe does not have any signs or a menu. However, the best Tacos in the area, as a lot of locals said. Especially the fish Tacos and the vegetarian Tacos were unbelievably good. It is located above the bar behind the fruit store and across the street from Buena Onda. At some day the restaurant is closed, so try if it’s open when you are in Puerto Escondido. After surfing in Puerto Escondido you are hungry, for sure. Sometimes you might just had enough Tacos, so some Pasta might be a good alternative. At Mondaka we had pasta and pizza. The pasta was a lot better and highly recommended if you crave for something else than Tacos. Also nice is their “fruit aqua” which was refreshing and not too sweet. At the very end of the sandy street of La Punta two guys built a great place to hang out. The music is always amazing, they offer a great variation of Mezcal and cocktails. We spent several hours here chatting with people from all over the world and philosophized about mezcal. All this should have shown that surfing in Puerto Escondido is insane. It’s a great spot on our earth you should add to your bucket list. Even if you are not into surfing you will be able to relax and enjoy yourself. La Punta, we definitely come again! // *Affiliate-Link: When you book via this link we will receive a small commission. But don’t worry, there won’t be any additional costs for you. ➳ You are looking for some more infos for your Mexico trip or still searching the perfect travel route through Mexico? ➳ Or are you planning to visit the surf mecca in Nicaragua – San Juan del Sur? 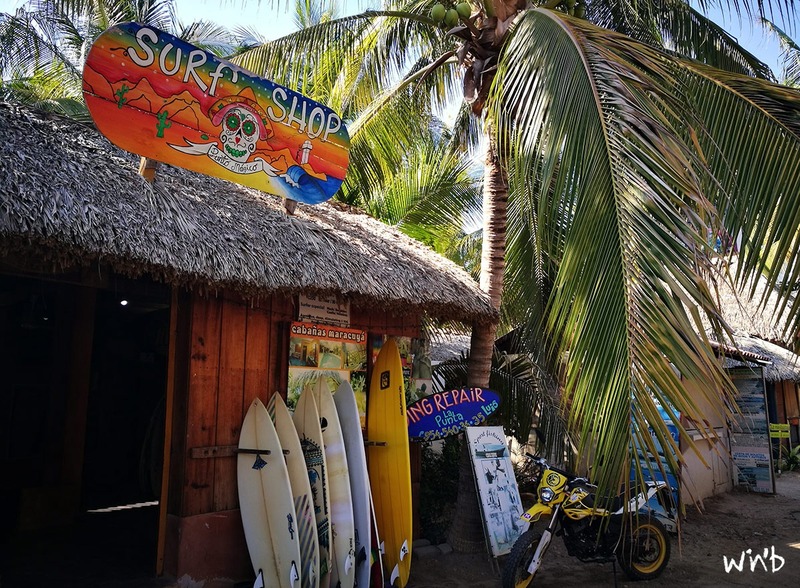 You have shared an amazing information through this blog and I’ve came to know about surfing in Puerto-Escondido and this destination is new to me and I have learnt a lot about this place and keep it up with your work. Hey, thanks for your great info, sure my wife and i wil go to the restaurants you advised. We go half februar to try some surfing, and like to know a bit , about how we, as beginners do best..
We booked a place to sleep already..
shal we book private lessons in front ? i saw on a site that use of board is in the prize of the lessons.. but after ? Can you give us some tips ? First of all sounds like a great plan! La Punta would definitely be a good spot to try surfing. Once you are there you should ask for other beginner surf spots close by. Indeed, 1250 mex pesos sounds quite a lot. As we don’t know the exact prices, you should ask and compare once you are there. Surf board rental was significantly cheaper and you will find them in every store near La Punta. Hope we could help you. Thanks Anika, enjoy life !! !